So there you are – onstage, alone, heart beating wildly. And for the next two to five minutes, all eyes will be on you. It’s time to show them what you’ve got. Yes, it's that moment that so many performers love and loathe, where there's nothing between you and stardom but that possibly-brilliant, possibly-idiotic person sitting third-row center, who will be judging whether you're right or wrong for the part that you know you were born to play. It's time to step up and audition. But what many performers may not be aware of is that, while you may feel like you're auditioning for an enemy (or just a friendly neighborhood firing squad), the fact is, the people you're auditioning for desperately want you to succeed. That’s right, they're on your side. Each time a performer steps up, the director, stage manager, choreographer, music director, producers, and playwright aren’t rooting against you, but for you. Each and every new auditioner represents the possibility of that potential star they’re seeking, that just-right person for their production. So show them your best possible self. To help you do this, the following are five audition mistakes no performer can afford to make. Don't do these things, and you'll end up with a more positive and dynamic audition, and result! Do these things, on the other hand, and you're likely to find yourself playing that big scene to your relatives (or pets)... not to an audience. Not if you don't want the part. If you do want the part, and if you don't know the work in question, get educated. Read it at least once before you show up, and, even better, practice some of the biggest or most famous scenes with a friend or fellow actor in advance. The audition process is a long and tedious one for directors and performing arts groups, so by all means, show up late and looking like something the cat dragged in. Or, if you want the part, be professional and prepared. Show up on time, looking great, dressed appropriately (more on that below), and with a current resume and headshot. Don't forget your sheet music if you're auditioning for a musical! A monologue is not a monologue is not a monologue. So if you're auditioning for The Glass Menagerie or August: Osage County, your ideal monologue isn’t going to be something by Oscar Wilde or Tom Stoppard, but rather something with that plainspoken feel – Sam Shepard, Beth Henley, or a similar voice. 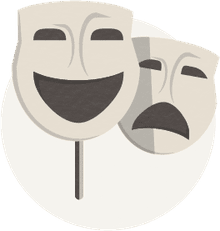 It’s always best to have some go-to monologues of different styles and genres – not just dramatic or comedic, but within a range of styles. So here, prepare a monologue that allows you to show a similar range like that of the work in question. But – if you can help it -- do NOT do an audition from the actual work for which you’re auditioning. Just within the same ballpark. Again, it’s about nuance. It’s not enough to show off your voice, but also your flexibility and style. For musicals, prepare songs that give off a similar feel to the work in question. Be canny in your selections -- if you're looking to play Sally or the Emcee in Cabaret, for instance, don't show up with a song from Curly, Ado Annie or Nellie, but which instead calls to mind an edgier, darker man or woman – something from Chicago would be ideal there, not only because it's a good stylistic fit, but it's even Kander and Ebb. Just kidding: Don't. This is a common rookie mistake, but it’s an approach that can have wildly inconsistent results. While it sounds smart to go in dressed like Eva Peron or Roxie Hart for that next audition, and we've all heard success stories of actresses who did this to great success for film, the fact is that your vision of the character may vary radically from the director's. If you go in completely ‘charactered-up’ to the nines, your results are guaranteed to be a total hit or miss -- either you'll knock it out of the park, or you won't make it to callbacks. Going this route is risky because you leave nowhere for the director's imagination to go. Instead, show up as yourself, but with those few subtle nods to the character in your hair or dress or makeup. The key word here is subtle. So, sure, suggest the part in how you dress for auditions but do it subtly. Start from a business-casual median, then add subtle dashes of character from there. For instance, if you're auditioning for a period character, wear your hair in a way that reflects a subtle period approach (an updo or bun for you women, or a slicked-back or side part for the guys). Suggest characters in your dress choices, but only in a very general sense -- wear a dress or skirt (or suit) for the appropriate roles, or, by the same token, go with slightly more casual attire where warranted as well. Do your makeup with the same approach in mind – go a little more dramatic for the darker or brassier characters, or emphasize youth and sweetness with softer, more innocent tones for younger or more virginal characters. Now get on out there and show them you’re a star.